Each teacher and artist worked together with the students examining one of the two Biennale art installations, Blue Trees and Trans Am Totem and through cross-curricular guiding questions they developed their own art creations to inspire environmental action and volunteerism. Students looked in particular at Bowcott’s “vision of nature …[and our] ongoing contributions to global warming and further environmental degradation through Trans Am Totem and Dimopoulos’ effort to unite environmental consciousness with social action through Blue Trees where he highlights trees as the lungs of the planet and causes us to ask what happens if we get rid of all the trees? Don’t we need to take action to ensure that does not happen and how do we inspire everyone to take the required action – what role can art play in this inspiration? 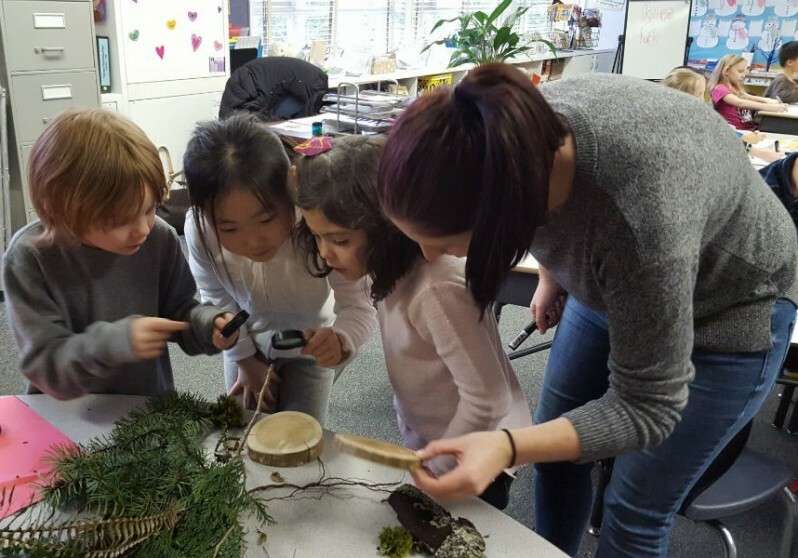 This Surrey BIG IDEAS project crossed primary, intermediate and secondary grades and involved learning in science, geography, history, language arts and the four art disciplines: dance, music, visual art and drama. Each school explores a common BIG IDEA “How can Art inspire environmental volunteerism and social action?”. Through this theme, and through an examination of the Blue Trees and Trans Am Totem, classes explore how art and artists have inspired environmental action and volunteerism by individuals and groups across the globe, in Canada and locally. What statements have artists strived to make about environmental impacts and destruction, about climate change, about our role in damaging the planet and our necessary role in taking action to stop that damage and repair our environment, our animal habitats, and our planet. The classes explored the artwork through video and stills online as a springboard for the Helping H-Arts cross curricular project. Artwork will inspire research and learning that work towards learning standards in environmental science (deforestation, carbon footprint, climate change, pollution, habitat reduction and extinction), language arts (reading research materials, stories, poems, and songs about environmental stewardship and environmental impacts and then writing plays, captions, songs and artistic plans for their projects), geography and history (where are the greatest environmental impacts in the world in deforestation, carbon footprint related to the Blue Trees and Trans Am Totem messages, what action has been taken where and by whom) and our four arts disciplines visual art, drama, dance and music. 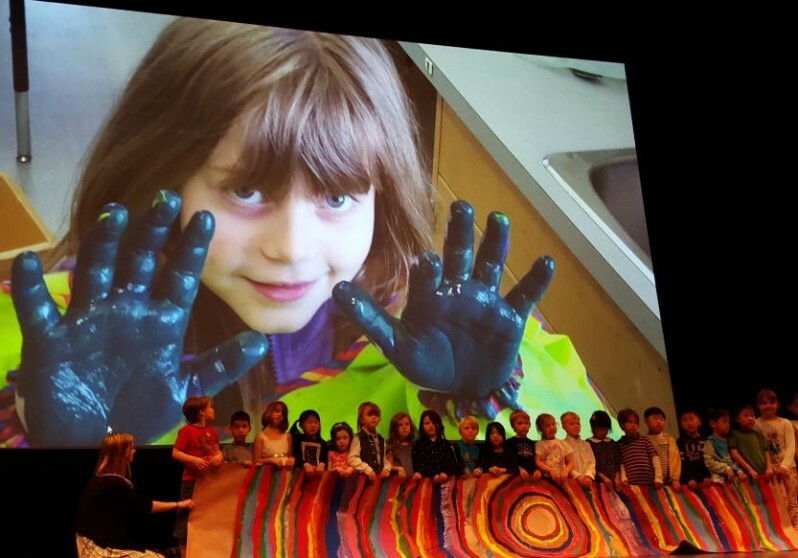 The students and teachers continued their investigation of the BIG IDEA through their chosen art medium and produced a final presentation of their ideas, thoughts, concerns, solutions and suggestions in their chosen art form at a Vancouver Biennale Final Celebration held on April 1st, 2016 at the Bell Performance Centre in Surrey. Art can inspire environmental volunteerism and social action through the messages they encapsulate such as environmental degradation and the impacts individuals, companies and countries are having on the natural environmental. Individuals and groups can inspire small and large scale environmental action and volunteerism to have a positive impact on our planet and our environment. What impacts does deforestation have on the local and global communities? Has deforestation increased over time? What is causing deforestation, is it small scale or wide scale issue? How does consumerism impact the environment both across the globe and from what we buy at home? What is causing increased consumerism? What steps can we take to reverse the increase and how can art play act as a point of inspiration and a call to action and understanding for those around us? In preparation for this performance the Grade 1 students at MB Sanford Elementary learned about bees, and butterflies, and their valuable relationship to plants. The performers would like to convey a message discouraging the use of pesticides, and encouraging people instead… to plant flowers this spring! Planting flowers makes a healthy, happy environment for bees and butterflies. Grade seven students at Old Yale Road Elementary School called upon the ancient voices of storytellers as they collectively composed and performed a short, allegorical play examining the importance of maintaining a balanced relationship with our natural environment. 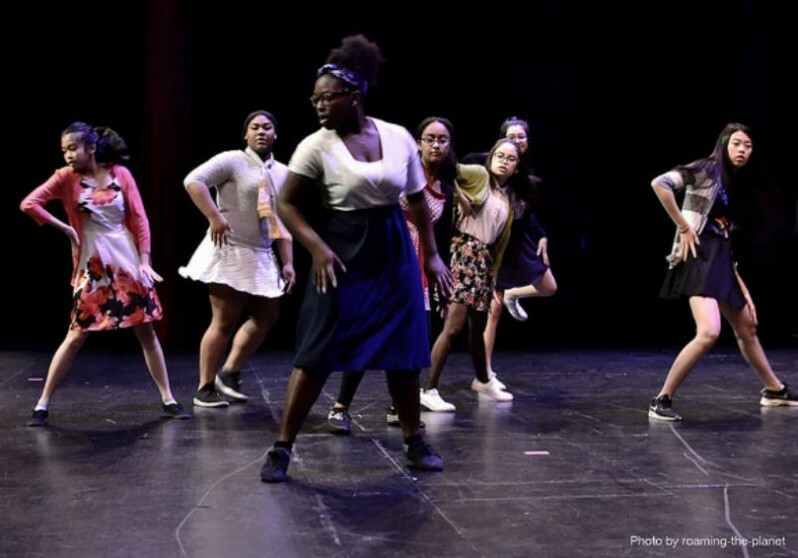 As initially very few students had previous experience as dramatic artists, we explored the discipline of theatre and how the stage could be used as a platform for communication. With the “Blue Tree Project” as inspiration, students brainstormed associated environmental themes and story ideas and finally, after much debate and laughter, they decided that a tree would be the main character. The tree was given a name and identity and thus the Tale of the Muffin Tree was born. We all know we can’t survive without oxygen generating forests. Students took this one step further and asked the concrete question, “What if trees were a kind of food? What would happen if that food was exploited and there was no longer enough to go around?” Students could relate to the sensation of hunger and very quickly devised a narrative that took measures to protect the Muffin Tree for future generations. They worked in groups to write and perform, using animated tableaux. The result was a humorous, thought provoking and fully formed play; one that challenges audiences to maintain a society where there will always be enough ‘muffins’ for all. 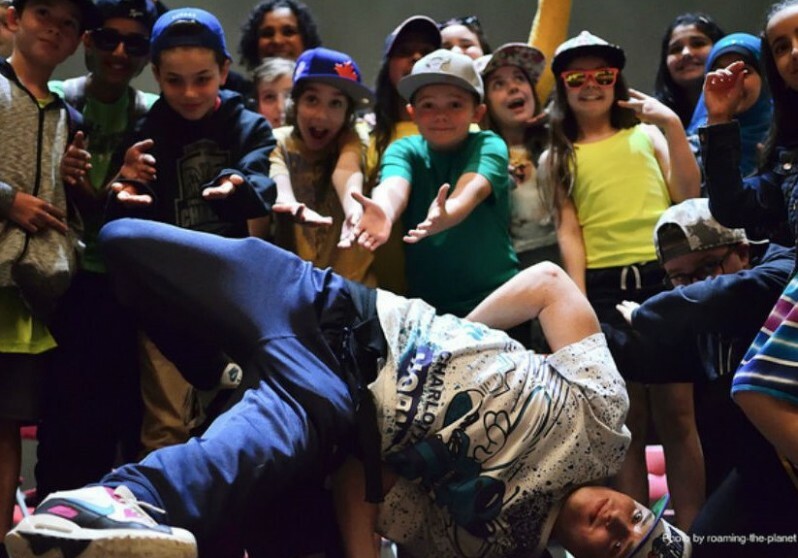 As a part of the Surrey district wide BIG IDEAS program focusing on environmental activism and volunteerism; selective students from the grades 6/7 classes at Katzie worked with Hip Hop artist Kia Kadiri to create 2 songs, set to a medley of music selected by the youth. Both songs written by the youth were powerful pieces acknowledging the need and desire for self-expression. Over a 6-week period students had the opportunity to work with Kia, and worked very hard during 8 sessions to complete their writing and music. They explored the history of hip-hop culture, and related it to different types of activism, as well as learning the technical aspects and many styles of writing. The class had the chance to record both songs, and excelled in a short amount of time between both recording sessions. It was exciting for Kia to watch each group grow and develop their creative skills. Please join me in welcoming Katzie elementary, performing “Step into the Light”. without words, across cultures even. A few months ago, the Frank Hurt students performed for the residents of the Arbourside Retirement home. They were met with a fond, enthusiastic reception and felt energized by this new relationship to the community. Our dance strives to awaken that sense of agelessness and spirit. to know? What message do we want our art to send and what effect do we want to have on our audience? What actions can we, as a community take to assure that our forests are protected?” Diving into writing a collective poem that captured the essence of a mysterious, magical, peaceful grove where the trees sang, they built the initial scene of their play. In contrast, the next scene introduced the invasive and destructive forces of over-industrialization and as the trees disappeared, the forest became, “as silent as an empty house at midnight,” the trees’ once joyful song diminished to a whisper. Only with the help and awareness of the local children does the forest’s symphonic voice become re-invigorated. The play ends with a call to action where students invite everyone to sing to keep our forests ‘evergreen’. The grade ½ class from H.T. Thrift decided to use the Blue Tree project to explore the importance of forests and the impacts of deforestation. We started our investigation with a field trip to Sunnyside Urban Acres. After spending some time examining trees and other parts of the forest, we drew our own trees and turned them into beautiful watercolour and pastel pictures. Our class was able to use clay for the first time to create our own trees – we enjoyed shaping these with our hands and adding details and animals! We also made our own tree stamps with wooden blocks and sticky foam! We spent a lot of time talking about the amount of wood products and by-products encountered in daily life. We discovered that paper is made from trees, so after watching a video about the paper making process, we collected the recycled paper bins in the school and decided to upcycle the paper, decorate them with our handmade tree stamps, and turn them into paper fortune tellers for our final presentation! Just before Spring Break we set up a display of our cumulative projects and invited our big buddy class to check out all of our hard artistic work, and shared everything we learned throughout the process! As a part of the Surrey district wide BIG IDEAS program focusing on environmental activism and volunteerism; students from Sunrise Ridge worked with Hip Hop artist Kia Kadiri to create a rap song featuring original lyrics, set to a medley of music selected by the youth. Over a 6-week period students, had the opportunity to work with Kia during 8 sessions. They explored the history of hip-hop culture, and related it to different types of activism, as well as learning the technical aspects of collaborative writing. Finally the class had the chance to record their music, and assemble various types of mixed media such as artwork and photographs to create a fun slideshow featuring their song “Save The Sky”. The Kindergarten students at Sullivan Elementary met an owl, named Pokey, who could no longer take care of himself in the wild due to an injury. Pokey was found badly hurt near a road where mice and rats come to eat from the litter that humans leave behind. In order to help animals like Pokey, this class took action by collecting litter from around their school. The Sullivan Elementary Kindergarten class would like to ask everyone here to, please, take your litter with you, and not ever leave it behind. Grade nine/ten students in Mr. MacIntosh’s drama class at Enver Creek Secondary tapped into the collective consciousness of both industrialists and environmentalists to find the voices behind the issues depicted in both the Blue Trees and the Trans Am Totem. They spent a lot of time exploring their knowledge, assumptions, feelings and actions around consumerism and excessive consumption and our actual needs. 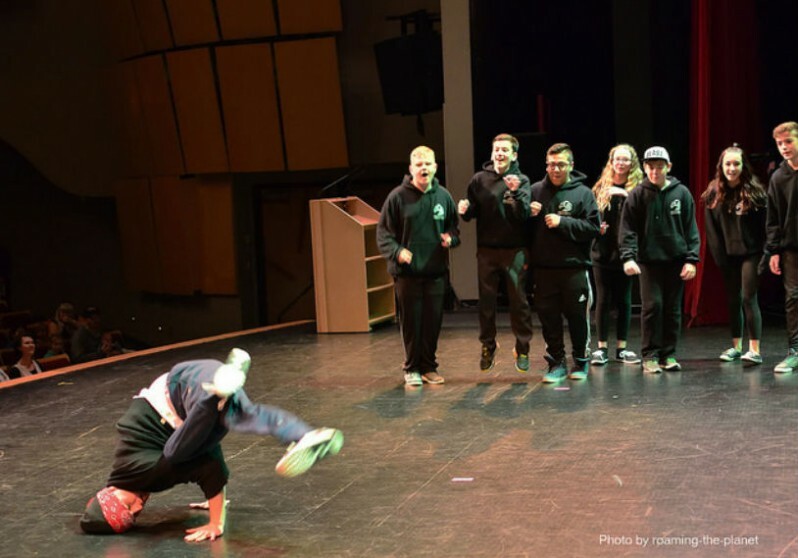 Driven by the energy and the passion inherent in their voices, students channeled their thoughts into rhyming couplets and set up a rhythmic rap battle between factions. Though coal may be the goal, do trees have souls? Do we need mills to pay our bills? This fierce and invigorating verbal battle coaxes the audience into considering their roles and responsibilities to the environment and demands that they take action. Clayton Heights Secondary’s project of visual art and action, was informed by Marcus Bowcott’s Trans Am Totem. 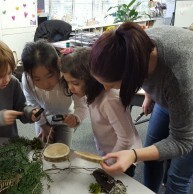 Through photographic inquiry and an exercise in constructing solutions to first world problems, students worked in small groups to investigate issues of mass consumerism, urbanization and deforestation within their own community. Confronted by the litter in their environment, students decided to create an installation from this trash. This allowed them to make collaborative art, while cleaning up the environment and engaging with community. Their work titled “Evolution of Man’s Impact on The Environment” depicts 6 full body casts, progressively filled with more and more man made waste. Students wanted to demonstrate and create dialogue around the current issues of litter, waste, over packaging, consumerism and our disposable culture. Teachers were introduced to the Vancouver Biennale Open Air Museum specifically Blue Trees and Trans Am Totem and BIG IDEAS program. 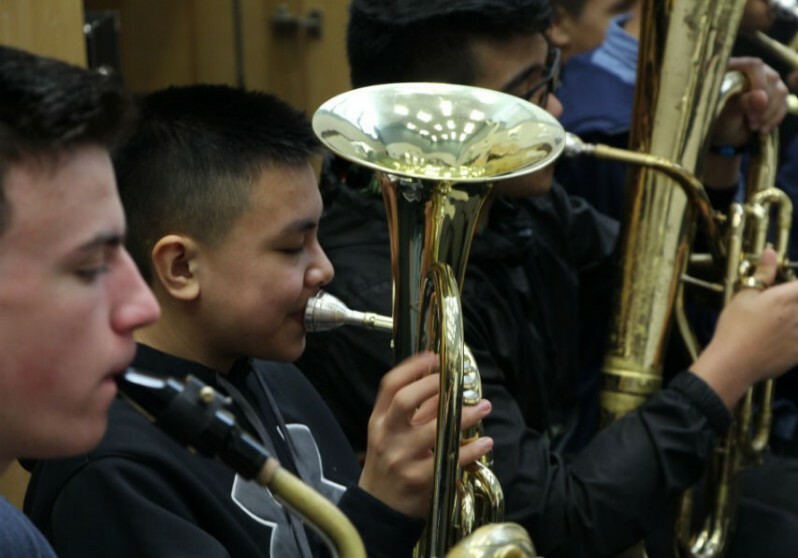 It was a great pleasure to work with Dean Ritchey and the band students at Guilford Secondary School in Surrey. 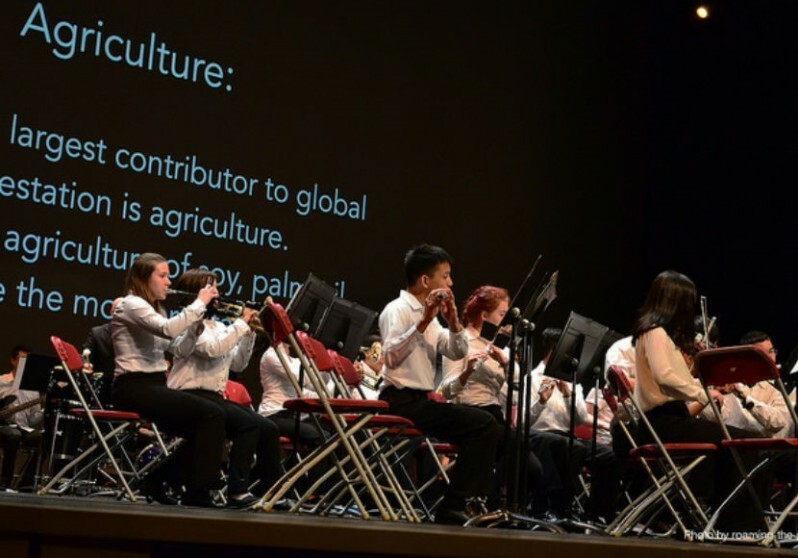 Using the concept of deforestation as a departure point, we created an original score that would accompany a video essay exploring the human causes and global impact of deforestation. 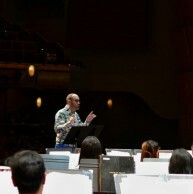 Working with a band/orchestra to create original music is a huge undertaking one that would not have been completed within the 8-class time frame if not for the development of a unique compositional method. Using blocks of 4 and 8 bar phrases created for each instrument, we were able to align and arrange these musical blocks in various combinations to create 3 distinct sections of music for our video. This block method of composition allowed for students to develop their score based on their individual experience level and creative ideas, allowing for a sense of autonomy and ownership over the composition and its creative development. A strong critical component was also infused into our classroom activities, using the Blue Trees exhibit as a departure point to facilitate numerous dialogues exploring environmental activism and the role of the artist in communicating important messages to the public in provocative and thought-provoking ways. By studying Dimopoulos’ Blue Trees exhibition and its accompanying online documentation, the students developed an ability to express and communicate verbally the concepts and messages contained within our video and music score. This in turn served as the catalyst for a more embodied and focused performance of the score as well as the development of a sense of importance and validity for the work that we were creating together. I am tremendously proud of this collaboration and grateful to the Biennale for funding this complex and highly rewarding project. My work this year with Vancouver Biennale and the Surrey School District ranks with some of the most rewarding in my artistic career. It was transformative, enlivening and inspiring for all. As a drama artist, I collaborated with a grade 4 class at Forsyth Road Elementary, with a large group of grade 7 students at Old Yale Road Elementary and with a grade 9/10 drama class at Enver Creek Secondary and their marvellous teachers. From the beginning we were all artists; we were immersed in the artistic process, in a race to fill what began as a blank page and an empty stage with words, images and actions that would reflect our roles as ambassadors to the environment and our responsibility to the world to share a message, through art, that we can all be change makers, that we all make choices on a daily basis that affect the health and well being of generations to come. It quickly became apparent that knowledge is power. All students first explored the art of inquiry. The visual text behind the artwork of Dimopoulos and Bowcott made them wonder, introduced the vocabulary of deforestation and over consumption. It was clear that most students has not contemplated such “BIG IDEAS” before let alone been asked to transcribe their opinions into art. The first thing they learned was to have, speak and value their opinions and those of others and to categorize and realize that though opinions may contrast or clash, they all needed to be heard and processed. The biggest challenge was creating connections between students and these “BIG IDEAS”. Once we shared knowledge, the art flowed. 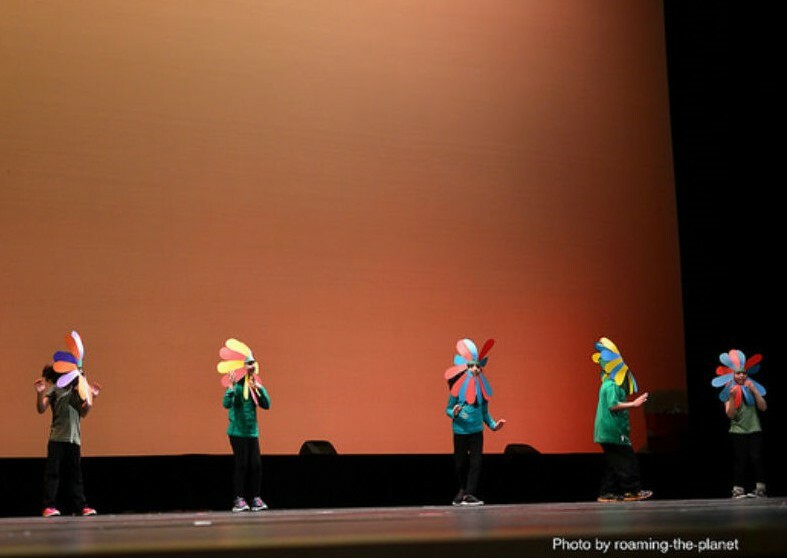 Using poetry, metaphor, music, drama, storytelling, creative writing, spoken word and photographic or illustrated metaphors each grade developed a remarkable play, and though the theme was identical, the art was diverse. 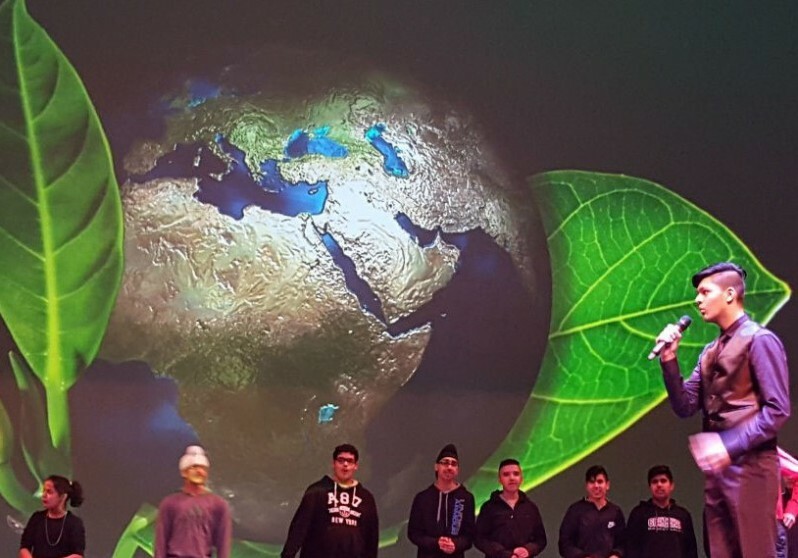 The grade 7 class called upon the ancient voices of storytellers as they collectively composed and performed a short, allegorical play examining the importance of maintaining a balanced relationship with our natural environment. 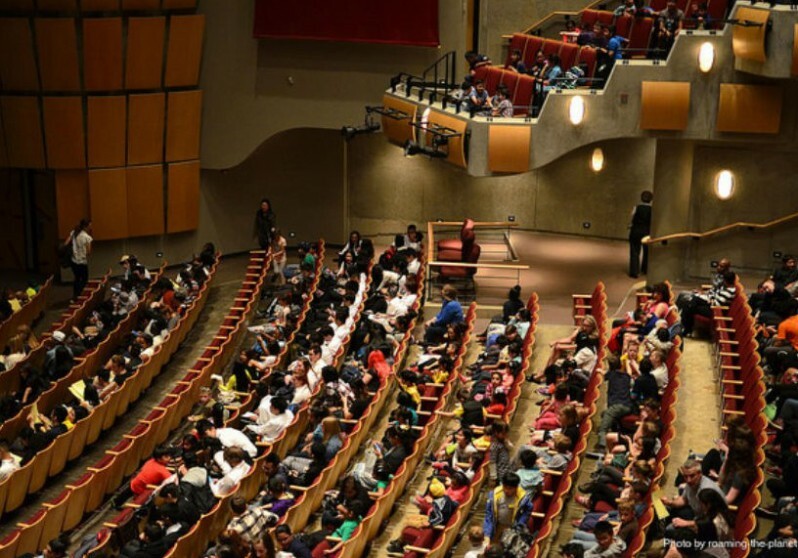 The power of art to transform and empower was evident here as students learned to collaborate, found their voices and learned to be leaders through performance. The result was a humorous, thought provoking and fully formed play called “The Muffin Tree”; a play that challenged audiences to maintain a society where there will always be enough ‘muffins’ for all. The art making process was strong here as it encouraged students to speak clearly, to honour the power of words, provided opportunities for them to be courageous and discover new gifts and enhanced their leadership and communication abilities. They felt pride in their accomplishments. The grade 9/10 class spent a great deal of time In process. It was a fantastic opportunity to explore how art shifts and adapts to circumstance. They took to heart the inquiry into the issues behind the Biennale artwork and took leadership as to how they would collectively interpret it. Their voices took time to find form but when they did, they created a powerfully delivered, very vocal rap battle between environmentalists and industrialists. The theatre techniques that they mastered such as characterizing body language, blocking, and vocal rhythm, volume and pace will serve them long into the future. This year’s Biennale project with the Surrey School District speaks to the power of art to transform and inspire: to transform thought to action, to inspire excellence and artistry, to transform voice, to inspire youth to acknowledge and celebrate the power of their collective voices, to transform fear and apathy into confidence and action. Transformation, inspiration…Vancouver Biennale. This project was realized through the commitment, dedication and collaborative efforts of the student photographers in the Grades 10-12 class at Clayton Heights Secondary, Dennis Memmott, their Visual Arts Teacher and the broader school community. Big thanks to everyone for all you’ve contributed! Students acknowledged the importance of commitment to the project, collective involvement and their own responsibilities herein. They demonstrated social responsibility, recognizing that their individual contributions mattered and were integral to the strength of this collaborative group work. This often meant pushing beyond their personal comfort zones. 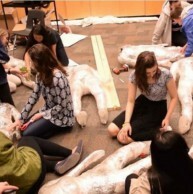 When casting the sculptures student groups recognized the vulnerability of their wrapped models, displaying care and sensitivity through their interactions. Upon arriving to class, Dennis often witnessed students happily at work on their casts. As a result many new relationships were formed and a cohesive class created. – School storm closure right before spring break meant cancellation of a planning session for the art in action happening, interviews and a studio casting session, with the Bell showcase event happening within a few short days upon return to school. – From inception students had planned to install Evolution of Man’s Impact on the Environment at the Bell Performing Arts Centre. They expressed the importance of their audience experiencing and interacting with their work and the issues it addresses. It was very disappointing to learn that the venue could not accommodate installation. – Despite our attempts, we were unable to safely transport the sculpture to the Bell Performing Arts Centre on its constructed base. As a result, we were required to disassemble the work and carry the individual pieces on to the stage, altering our intended plan for presentation. Immediately after the Bell showcase event, Dennis and me had an opportunity for some reflection. We are both pleased with the project and its outcome, our collaborative work, the support and involvement of the school community, student engagement and their ownership of the project and the relationships that have ensued. The power of art and arts integrated learning to educate and empower individuals, create human connections and strengthen communities was evident throughout. A 6 week window of time. (Performance at The Bell Centre providing a deadline). We overcame these by watching the Blue trees video and yarn bombing the young tree outside the kindergarten classroom and later tracing its root system on the ground with blue yarn. Once the students had watched the videos and grasped the “message” it was decided that the class’ collective action would be to pay this message forward. 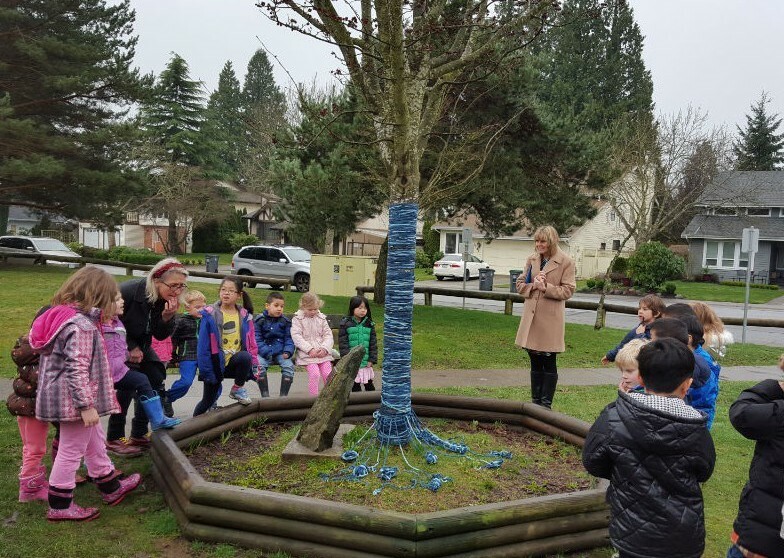 They were encouraged to answer other students questions about the Blue tree installation in the playground (which later had blue leaf imprinted clay leaves added to it) To do so we embarked on a 6 week plan to learn about and foster a deep appreciation of the trees in our immediate environment. Nicola already has her class spend one afternoon a week in the forest in quiet nature time, and we used this as a basis for recording what trees have and supply us with to what they need to survive. A central activity that ran through all our various explorations was to comprehend the age of trees in relation to ourselves. Rings on a paper plate served to illustrate each child’s timeline and their 6 to 7 years of life to date. They asked the ages of people around them: their teacher, parents and grandparents. Each day the paper plate motif was added to with each student eager to add some rings. Before Spring break we were able to gather around our tree rings and count them: 40 years – the same age as their teacher and half the age of some of the trees in the forest adjacent to the school. I loved spending time with these young artists. They were eager to share stories, receptive, observant and learning so fast every element of the project had so much potential for cross curricular learning – measuring, counting and recognising shapes and patterns; building vocabulary; developing social skills of respect and understanding and mostly a delight in manipulating materials. Nicola embraced and enhanced the project with stories and reflections and managed our many short periods of time together expertly. The questions, observations and interests of the students at H.T.Thrift after watching the Blue Trees video suggested that we could have taken this enquiry in a number of different directions. In consultation with the teacher, Jenn Yule it was decided that we would use as balanced as possible an approach to deforestation and find different media to express our findings. They were equally excited about working with clay and anxiously anticipated their clay pieces coming out of the kiln but most of their questions and research centred on where paper comes from – paper being the most widely used wood product we were able to identify in the immediate classroom environment. The students collected paper from the recycling bins around the school and organised it so that we had uniform squares of paper to print on. Each student made a stamp and explored the possibilities of repeat patterns. Later these were folded into paper fortunes with the revealed questions compiled from a list of questions that summarised our 6 week long project. Before Spring break the class created a “gallery” in their classroom composed of the 2d and 3d projects they had created and invited their buddies for a viewing. They were able to demonstrate their findings by playing the interactive paper fortune game. While both the teacher and I could have benefited from a longer “lead-up” time to the project in which to plan and research meaningful volunteering opportunities around environmental stewardship the extent to which art provided a catalyst for learning in the classroom was impactful and exciting – both for Jenn and myself. I especially enjoyed watching the students infuse their artwork with their own personalities and findings. Overall, this was a validating experience for all involved. This project is generously supported by City of Surrey. All photos at the Bell Performance Centre taken by roaming-the-planet.